Yes you read the title correctly. Drowning IN coffee. I’ve also called this recipe Spicy Caffeinated Chicken, and lunch. This is how I roll. I’ve been working on the recipe for about 2 months, and I think I have it right now. I’ve made this successfully about 4 times. Further down the road this will be a full on how to video from soup to nuts. but for right now, some pictures will have to do. I have done this with a healthy dose of Siracha sauce in the bag as well… And highly recommend it for thrill seekers. Take everything, except the coffee and throw it into the ziploc bag. 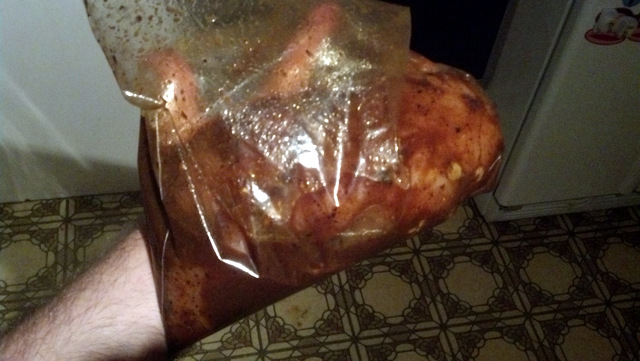 You can poke a couple of holes in the chicken breasts with a knife to help push the marinating along. I usually wait 24 hours after this step to start cooking. A good thing to prep the night before your caffeinated dinner. 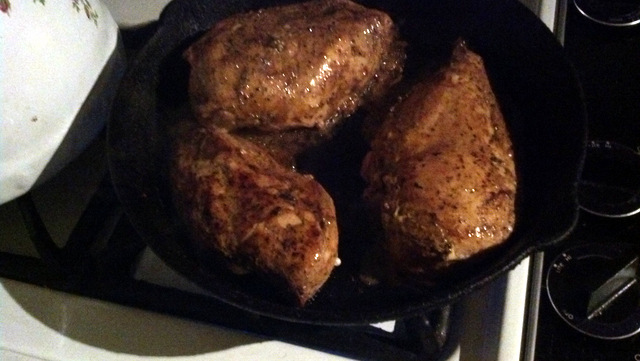 After about 24 hours the chicken should look like you see above, except you know… it will be in your kitchen. not mine. Get your cast iron skillet nice and hot, If you are going to do this with another type of pan i just don’t want to know. Cast Iron is simply the way to go. Slap a couple of the chicken breast down, skin side down. Now i know we said skinless, but the side were the skin USED to be, the smooth side, is usually a bit tougher. And takes the first sear well. 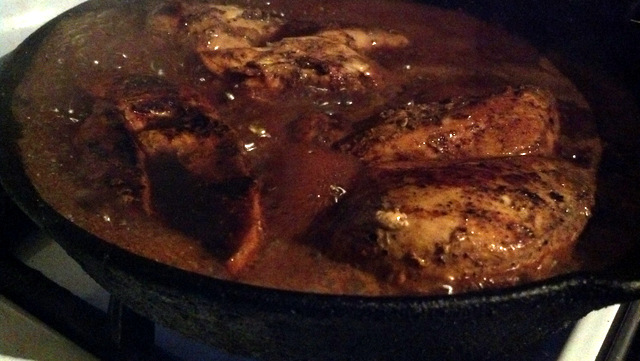 I cover the pan with a pot lid during the searing and cooking it makes the chicken turn out much moister. 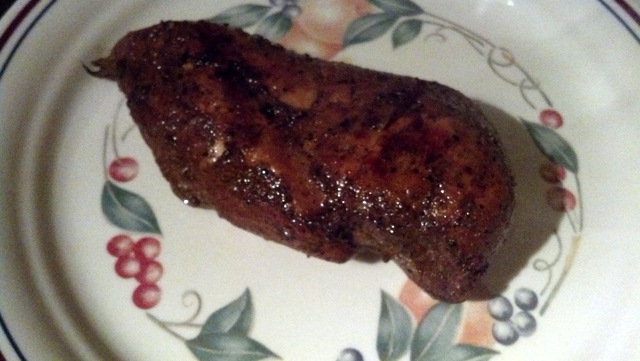 After about two minutes flip the chicken and it should look like this. 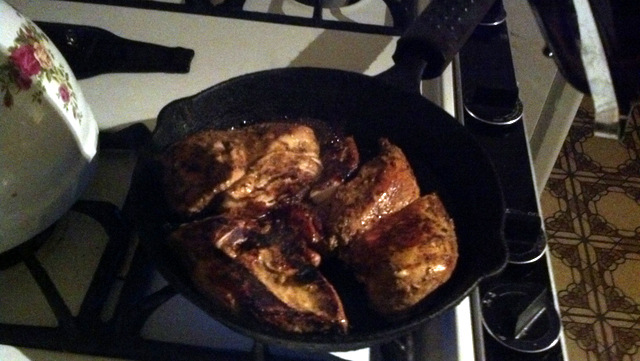 There is a light sear on the chicken at this point. And small amounts of carmalization. Wait about two minutes or so to sear the second side. Then you want to turn the heat down to a low medium and flip the Chicken back to side 1. Let it cook, covered there for about 3 – 5 minutes. 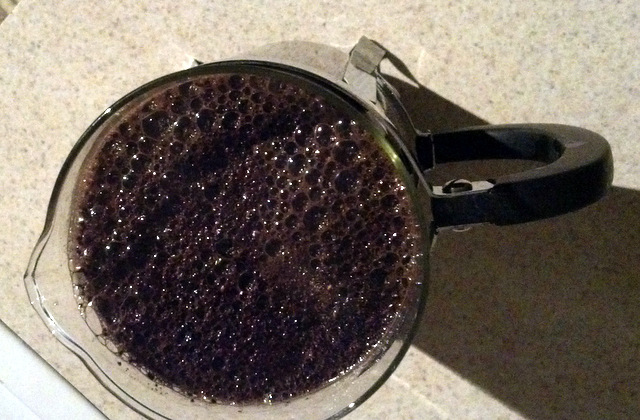 During this time brew you favorite dark coffee, a light roast doesn’t work at all with this. Now flip the chicken back to side number 2, it should have a heavy crust on one side of the chicken and a lighter crust on the other. Now for my favorite part. Slowly pour the coffee in the center of the pan (Don’t want to pour it over the chicken and strip the crust off. ) 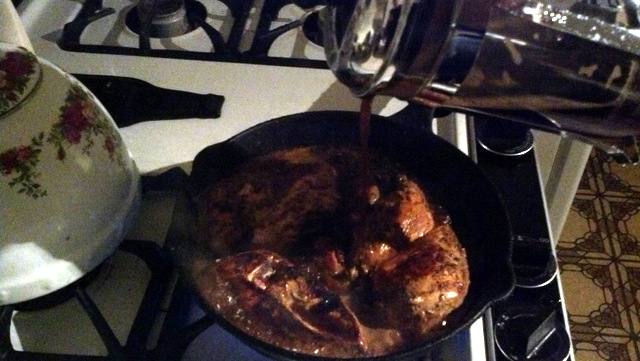 Keep pouring until 3/4 of the chicken is drowning in Coffee. Take a second and bask in the scent. The pan should steam and bubble quite nicely. Watch so that it doesn’t boil over and reduce the heat to low at this point. 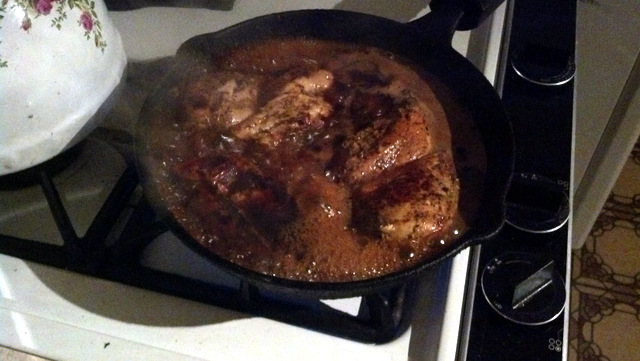 Deglaze the pan with a spoon rubing where the chicken was laying. The coffee should cloud up as bits of wonderful spice are freed from their moorings. At this point cut into the chicken’s thickest part to see if there is any pink left. If you see any, cut into all of the thickest parts of the chicken breasts and cover to simmer for another 3-5 minutes. The outside of the chicken should be nicely carmalized with a wonderful sear still intake for the most part. The more you move the chicken around the more the crust suffers. So be quick and decisive when moving it about! If done correctly the chicken should be spicy and smoky with a rich java fueled sweetness. It will taste like heaven on a plate. Pull that bad boy out and Bon Appetit! Man this was a fun recipe to figure out.